Oh what fun it is to see what's new at OWC, especially for us here at PLuGHiTz Live. This year they are showcasing the new version of their Thunderbolt 3 Dock, which was previously mainly for Mac. They have now added the Windows platform and lowered the price. The ports included on this new model: (2) Thunderbolt 3 USB Type-C ports (downstream port can support USB 3.1 Gen 2 devices), (1) Mini DisplayPort, (4) USB 3.1 Gen 1 Standard-A ports (rear) - 1 compliant with Battery Charging 1.2 spec, (1) USB 3.1 Gen 1 Standard-A port (front) - compliant with Battery Charging 1.2 spec, (1) Gigabit Ethernet port, (1) S/PDIF digital audio port (output only), (1) SD 3.0 media card reader (front), (1) Hybrid 3.5 mm headphone/mic jack. This new model will be available in February/March of 2018 at a price of $279. 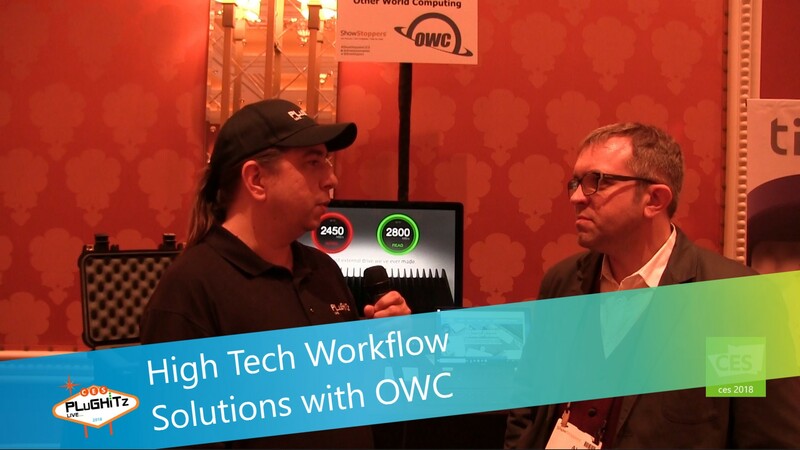 OWC has always been a storage company that is focused on any kind of media production. As more and more content is created, we not only need extended storage but also better transfer speeds. This next upgraded device will make life for us media professionals so much better. The Thunderblade V4 is a solid state RAID array (PCIE, MVME), passively cooled untie with no light in a flat black finish that is portable and fast. How fast? It has an almost 3 gig/second read with 2.5 sustained writes. When time is money and performance can't be beat... this new unit is as good as gold in our book. All this and it is durably designed to be out on the road where the content is being created. It is available immediately post CES 2018. From 1TB to 8 TB with pricing between $1,600 and $4,999, it will honestly pay for itself in production time very quickly. Take a look at all of OWC's products, available at Amazon.com.